The Federal Trade Commission (FTC) issued a rule in 1971 that all garment intended for resale must have care and content labels attached. This ruling was amended in 1984 to ensure that the care labels were not misleading. Manufacturers couldn’t label a garment as being 20 percent silk at the top of the care label (in big bold letters), and 80 percent polyester at the bottom. Additionally, a clothing producer couldn’t indicate that a dress is dry clean only, if it could be washed. Rules like these reduce customer confusion and false advertising. Investigate the fiber content of garment’s outer shell and lining fabrics. In the case of a jacket, the outer shell would be the outside fabric of the jacket, and the lining would be the inside fabric. Every fabric must be researched, as every fiber needs to be listed. If the outer shell has two fabrics, then both fabrics plus any linings must be investigated. A larger textile mill will provide this information on the fabric rolls or swatches. Smaller fabric merchants, called “Jobbers” by the industry, may not have the fiber information readily available. If this is the case, test the fabric either in house, or at a textile testing facility. Make a list of each fiber used in the outer shell. If there is more than one fiber used, as in a wool and acrylic blend, then place the fiber with the largest percentage at the top, followed by the second fiber (i.e., 65 percent wool, and 35 percent acetate). If the outer shell is made up of more than one fabric, then start with the predominate fabric. 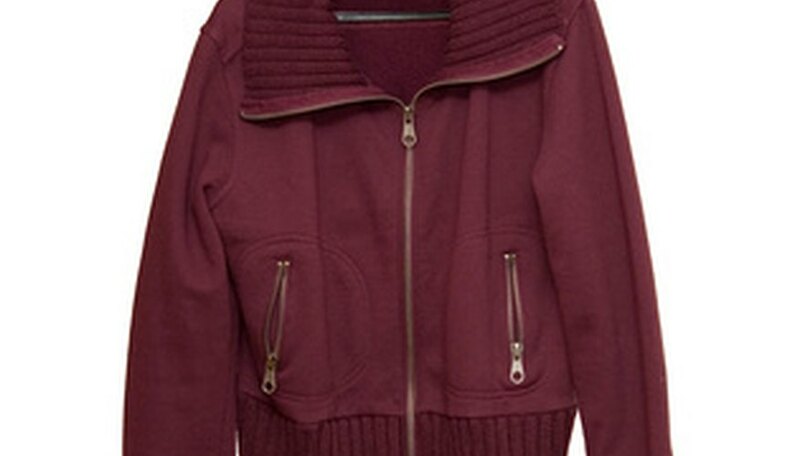 So in the same example, if a jacket is made of a wool and acrylic blend and has suede patches, start by listing all the fibers in the blended fabric, and putting suede as the last fabric on the list. List the fabric used in the lining after the fabric's outer shell’s list is composed. Follow the same format used when listing the outer shell’s fiber content, putting the fiber with the largest percentage first. Other materials in the garment’s infrastructure, such as interfacing and thread, are not normally put on the content label. Additionally, care instructions are not always listed on the same label as the garment's content. Send the sample garments to a testing facility, where they will be tested for shrinkage, color fading and any abnormal responses to washing and care. If a company is large enough, it might have an in-house facility that tests the garments by washing them at various temperatures. Other test include bleaching, ironing, and dry cleaning the sample garments. The results of testing will provide the information needed to draft the care instructions. These regulations govern the United States and therefore may not apply to other countries. If garments are intended to be exported to another country, it is best to investigate that country's label requirements, as it will be necessary to include them. It is common for garments sold internationally to have more than one set of content and care labels. Care and content labeling is enforced by the Federal Trade Commission. Mislabeling or not including the proper label on a garment intended for resale could result in fines. What Do the Markings on an Artillery Shell Mean?